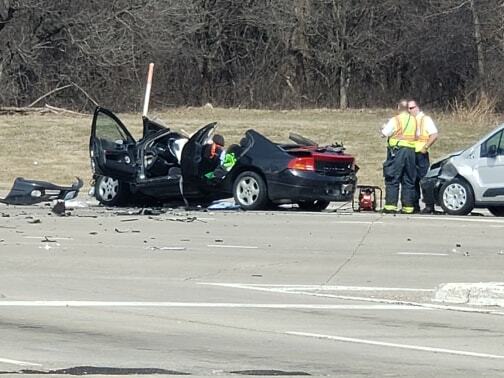 A woman from Gurnee was killed on Friday after a three-vehicle crash at Route 137 and Route 43 in North Chicago | Photo provided by William Schlitz. A 23-year-old woman from Gurnee was killed after a three-vehicle crash in North Chicago on Friday, authorities said. The North Chicago Police Department and North Chicago Fire Department responded just after noon on Friday to a three-vehicle crash at Route 137 and Route 43, near Abbott Park. Police said that a dark colored Dodge Intrepid sedan was driving southbound on Route 43 when it struck a northbound Ford minivan as the Dodge was turning left onto eastbound Route 137. The impact of the crash caused a third vehicle to become involved as well. Lake County Coroner Dr. Howard Cooper said that Rebecca Heraver, 23, of Gurnee, was pronounced dead at the scene. She was a passenger in the Dodge Intrepid. “We have been in close contact with Ms. Heraver’s family and our deepest condolences go out to them during this difficult time,” Cooper said. An autopsy confirmed she died from multiple injuries from the crash. Authorities did not release any further information about the circumstances of the crash, which remains under investigation by the Lake County Coroner’s Office, Lake County Major Crash Assistance Team and North Chicago Police Department.